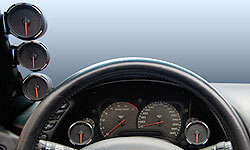 Racer Gauges are quick-responsive and high-accurate analogue gauges. Tachometers are also available. 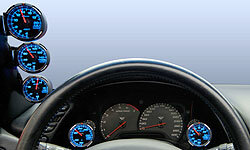 The tachometer’s diameter is 3 1/8inches(80mm) and the colours are red, white and blue. The scale variety is 9000RPM and 11000RPM. *Racer Gauges cannnot be linked to the Defi-Link System. Stepping motor “STEP MASTER VS-2” provides smooth operation. This function reports any improper connections, broken or disconnected sensor or sensor wire. The pointer will wave between 250 and 260 degrees.